I have finally dusted off an Agrios kit that has been in the cue for too long maybe 6 months. Using a Hobbywing 860 dual motor brushed each with silvercans and a 3s lipo for starters. Initial impressions if you don't want to watch the vid are positive. Plastics are improved in high stress areas. After seeing it together, I no longer have qualms with the body or wheel tire choice. Still have some option parts to install once I try it out for awhile now in stock form. I kind of struck out on the paint job. The only stickers on the shell here are the headlights. I have since added a few more as I wasn't altogether happy with the outcome. I used thin coats and never went for opacity on the reds and blues causing a bit of color difference on the roof striping. Next time I will have to pay more attention to backing colors. Nice build! I too build one of these a few months back. I installed ball bearings straight away, and found Tamiya USA still had some of the optional aluminum dampers Item# 54472. I also opted for TXT-1 wheels, and Jconcepts Firestorm tires, but will caution that the tires do rub the reserve tank on the aluminum shock bodies at full lock. I may go back to the original tires. Also I could go back to the plastic CVA dampers too to solve the rub issue, but those aluminum dampers look too sweet on this truck. I watched the video, you made a crucial mistake very early on, or perhaps you did it?, and I missed it?, I will check. Not once did you sniff them. Everybody here sniffs the tyres when they open a new kit,,,,, Right? @wolfdogstinkus I did sniff em' Optima still smells the best to me though. @Hobbimaster In the running vid, I used the Pro-Line Devastotors on the See's wheels. Fun fact, they have the same offset as the stock and TXT wheels when you remove the plastic wheel adapters and place the brass hex directly into the keyway that is machined into the wheels. The PL Devastator tires are slightly shorter in OD but are much squarer in side profile. Thinking out loud here, but what happens if you dial back the steering endpoints some? With 4 wheel steer the effect should be minimal with regard to turning radius. Eventually I will install the hop up shocks as well, I already have them, bought on sale for ~87 per pack from Tamiyausa a few months back. That will free up the CVAs for one of the Clods maybe. Still need to replace 12x6 bushings for bearings on the axles and work on the diffs, in the running video below, you can see at one point where the truck goes up on its two right wheels, both diffs unloaded and the inner wheels just spun under power(in the air). I have a few things I want to try, last resort will be some diff putty. I haven't started my DynaHead kit yet but it seems like it works quite well. Just this year the waterfront in my neighborhood has produced a sand bar at low tide. How serendipitous that I have discovered monster truck in a big way. Stay tuned for the rest of them, just have to do some editing for all four out there in the sand. geniusanthony, I'll give my travel (Spektrum here) adjustment a go. I don't have 4 wheel steering, but will most likely drop that in next. Very nice, see my thread here for pics but if you trim the body wheel arches higher, grill out etc it makes a world of difference. Thanks for the link back to your previous thread. 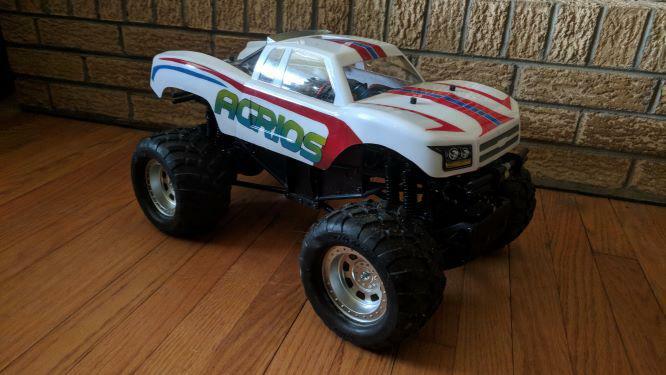 My wife really likes monster trucks (she'd love one for the commute) and I bought her an Agrios recently. The plan is for my son and I to build it in the summer. Now I can show them both the video and know what colour to paint it!! I like how the wheels look when blacked out against the black shell. I may have to borrow that from you as a nice easy project. I am curious about any updates on your behind the axle servo setup, how well does it work and was that enough support as shown? I solved it, worked well but sold up my whole collection by this time last year. Using the box section worked well (pic 2 last post in the linked thread). However, Whist aesthetically good, having the bumpers was more effective in general use. Can't believe how quickly time has gone since this project though. The wheels do indeed look great in black and I used a silver paint marker to highlight the nuts. No need for dual brushless etc. So today i took my txt2 out since the weather was about 45 today to try my jconcepts renegades and after running it for no more than 5 minutes I literally heard some light clicking when hitting the throttle even with the motor turned down. Unreal to be honest, i have no clicking when accelerating slowly. How others say they have no issues is surprising. I am going to let it go until or if it gets worse since i have 2 sets of axle gears. Very frustrating to be honest. The only positive is that the renegades handle and run so much better than the clods. Does anyone have any advice? Hopefully it's that and not something more serious, very common. If you caught it before any diff gear damage wont cost you a thing (besides time pulling the axle apart). If you did mess up any diff gears pretty sure you can get them through Tamiya still. The only other thing I would suggest is check the driveshafts for play if you're using the stockers. If you are, I'd suggest replacing them with Traxxas parts. The shafts are the only part of the TXT drivetrain that I hate, pretty much junk. Even under stock power they will hollow the pins out and eventually fail. Brushless power kills them quickly. Thanks for the advice i will definitely tear it down now and check. Just thinking out loud but the only thing that would effect the power is either an increase in drivetrain drag or your psyche. Before you open up the axle I would maybe give them both a spin and compare checking to see if maybe the front and rear "feel different". Unless the diff housing is rubbing inside the axle, I would think they are otherwise unrelated. Agreed, since there's no slipper clutch if there really was a loss in power it would most likely be catastrophic and it would stop moving altogether rather than slow down. Now, if the diff screws got loose enough its possible the axles shaft is slipping in the splines, but I'd think you'd have a much worse and constant noise issue. Go ahead and tear it down when you get a chance. Check the diffs and driveshafts, I'm sure you'll find your problem in either one and hopefully it's an easy and inexpensive fix. The TXT-2 is a great truck, just ran mine today and still love it. Thanks guys, i am off this week and will definitely tear it down one day. The speed dropoff and more so the torque isnt in my head though lol. I just hope it is the the 3 little diff screws like you mentioned and nothing worse. I did check the driveshafts and there is no extra play in them. I will post soon when i take it apart. Very nice. I never got the TXT-1 when I could, something I still regret. I need a TXT-2. Can you make the clod body and clod wheels fit a TXT-1 easily, ie are they a bolt on affair? The txt 1 rims are a direct fit and the clod tires fit those rims. I did that originally until i added jconcepts renegades which are night and day difference. They are a hair smaller, much lighter and have foams. My txt 2 now doesnt seem as bouncy or lug around. The body posts appear to be in the same location as on a clod, though the posts are 7mm on the txt and maybe only 4 or 5 on a clod body. Wheelbase may be another matter though. I can measure when I get home. Rb, I was thinking about your low power problem, I don't recall what motors and battery you said you were running. I have heard that running silver cans on 3s shortens their life, maybe a clean and a lube is in order regardless?